Plant of the month. April 2015 BUTTERFLY BUSH – Glacier View Landscape and Design, Inc.
April showers have started along the Front Range and we are hard at work landscaping Boulder Colorado’s finest residences. Plants of all kinds are starting to peak their heads up from a long winter’s nap. Not quite up yet, but one of my favorites are the entire Buddleja genus or Butterfly Bush. Famous for attracting butterflies to the landscape, they come in a variety of colors and sizes to suit any space. Endemic to the Americas, Asia, and Africa, they have only recently been introduced into the American landscape in the last 100 years. There are over 100 species, but only a few have been cultivated for use in the cultured landscape. The most commonly planted species of Butterfly Bush along the Colorado Front Range are the Buddleja davidii which come in a variety of colors including deep purple, blue, pink, and white, and are mostly in the height range of 4-8’. A few will reach 12’ in the right conditions. In other parts of the world, some Butterfly Bushes are evergreen, but here in Colorado, they are deciduous, and, in fact, need to be cut back to the ground in the fall or spring. They re-emerge from the ground up usually by early May. A second species of Butterfly Bush that gets planted here are the Buddleja alternifolia with the most common sub species being ‘Argentia’. This is a large and distinct shrub with silver gray foliage. Distinctly different from Buddleja davidii, these cannot be cut back in the spring since the flowers that emerge in late spring come from the previous year’s growth. Many an unknowledgeable “gardener” have wondered why they are not getting flowers and it is because they have been “pruning” their shrub to keep its shape and unknowingly removing the next year’s flowers! HOA “landscape maintainers” are often guilty of this type of blanket approach to pruning and end up with non flowering shrubs! Oh the shame! The ‘Argentia’ have been known to reach heights of 18’ high and wide, so it is best to have plenty of room for these specimens! Lastly, the dwarf varieties offer the most usefulness to the new subdivisions along the Front Range of Colorado because of their small size and appropriateness for the scale of yards often associated with new developments. Also in a multitude of colors, they provide a splash of color and a sweet scent that attracts both butterflies, hummingbirds, and moths. ‘Blue Chip’ is a variety I like. Speaking of butterflies….there is a great resource online for learning about the plants and foods that attract butterflies to the Southwestern garden. Wayfair dot com has anything for the home. Visit Wayfair for a comprehensive guide to butterflies in your garden. It is worth the read. 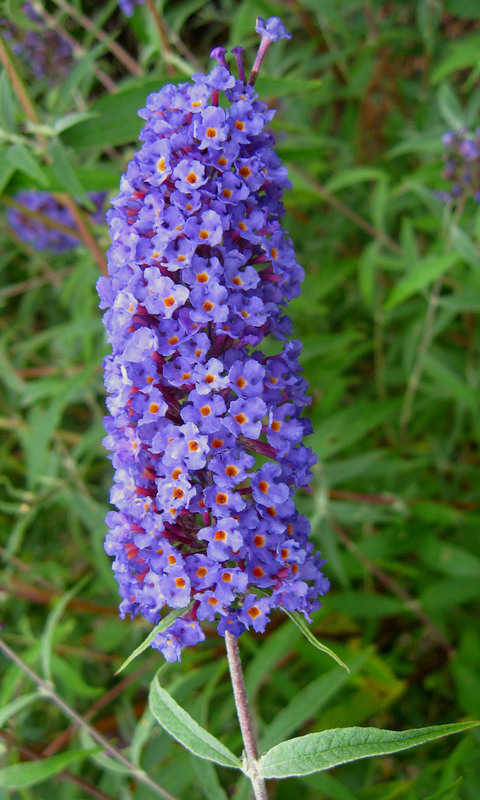 Enjoy a few Buddleja in your garden this year and bring on the butterflies and hummingbirds!